This post is part of a series in which ladies on the road offer a review of their backpack. Today’s review is from Melissa Shearer who’s been to 18 countries and is currently living in New Zealand. Check out more women’s travel backpacks here. Hey! I’m Melissa Shearer, more commonly known around the interwebs as Mellyboo. I am 25, Canadian, and a former film grad- turned waitress- turned worldwide wanderer. I’ve been traveling via plane, train and automobile since the wee age of 2 and have explored 18 countries (and counting!). Currently, I’ve been on the road since September 2011 with quick multi-day stopovers in Hong Kong and Macau, a 3 month stint in Sydney, Australia, and now have been living in the Far North of New Zealand for the past 2 months looking for some work before my next big adventure in May – Africa and South East Asia. I have the Gregory Deva 85L and it is currently retailing at MEC in Toronto (where mine was from) for $349.00. I was lucky enough to receive mine as a gift from my parents- sweet deal! I’ve had mine since September 2010 when it accompanied me to Sweden, Amsterdam and Paris. It’s also been with me all over Australia, New Zealand twice and Hong Kong once. For me, comfort was key. I knew that I had to look out for a pack that was specifically designed for women- especially since I’d say my chest is a bit on the bigger side. When I went to MEC in Toronto to check out their packs, I tried on literally every womens pack there (okay so it was probably about 6 or 7 choices) and walked around the store with them on for what seemed like an eternity. I also was interested in accessibility and having different ways of getting into the pack, rather that just top-loading. I am quite fond of the padded hipbelt, water resistant zippers and bottom panel, as well as the CFS Suspension system which is molded to fit the female form a bit better. The CFS suspension system also helps with proper weight transfer, so that you don’t get a sore back from overpacking your backpack. Downside? The only downside for me is that it is a bit too big. This is the ultimate bag for a woman. Seriously! It has a padded hip belt and padded shoulder straps. The back support system is heavenly and is designed to properly distribute the weight of your pack. The back frame isn’t adjustable, but it does come in 3 different sizes. I’m 5’9 and my pack is a medium and I don’t have any complaints in regards to fit. No. Definitely not. 85L is definitely too big to take onboard. While I’ve managed to not quite perfect the art of traveling light, I do realize that it’s simply because my bag is so big, it allows me to take much more than I actually need. If I were to do it again, I’d probably go for the 60L or 70L rather than the 85L. 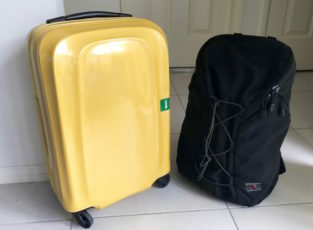 I highly recommend Gregory and the Deva model because it’s a reputable brand and has great features, however, I don’t believe most people need the 85L – it just results in overpacking. I’d recommend for the majority of female travellers to go for the 60L or 70L, that way you still get all the same features, but less space to fill up with stuff you’re going to have to lug around on your back. For those backpackers out there who are carrying more with them, perhaps doing more camping and trekking out into the wilderness, this pack may be a good fit. Melissa, thanks for sharing your thoughts on the Gregory Deva! Enjoy the rest of your time in New Zealand before you hit the road again in May. You can follow along with Melissa’s travels on her blog, Twitter and Facebook. Just wondering which backpack you used for a day pack to carry on your front, while carrying your deva pack?